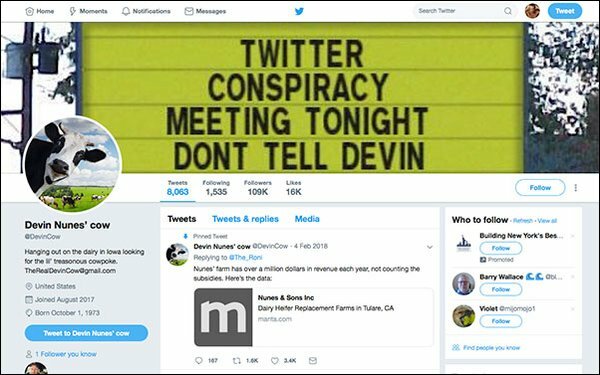 Rep. Devin Nunes has sued Twitter and three users, including the anonymous creators of the parody accounts “Devin Nunes' Mom” and Devin Nunes' Cow,” over allegedly libelous tweets. “Twitter allowed (and allows) its platform to serve as a portal of defamation in order to undermine public confidence in Plaintiff and to benefit his opponents and opponents of the Republican Party,” Nunes, a Republican from California, says in a complaint filed this week in Henrico County, Virginia. He is seeking at least $250 million in damages. Numerous courts have ruled that Section 230 of the Communications Decency Act protects platforms like Twitter from defamation liability for content posted by users. Nunes asserts that Twitter shouldn't be entitled to that protection, arguing that the company is not a “neutral” intermediary. Like some other Republicans, he contends that Twitter is biased against right-wing views. Others, including New York Law School professor Ari Waldman, say tech companies filter out material posted by liberals as well as conservatives. “Activists associates with the Black Lives Matter movement have reported just as many if not more take downs of images discussing racism and police brutality than any of the anecdotal evidence of suspensions or take downs on the right,” he said last year in written testimony to Congress. But even if anyone could prove bias by tech companies, they would still be protected by Section 230, according to the digital rights group Electronic Frontier Foundation.